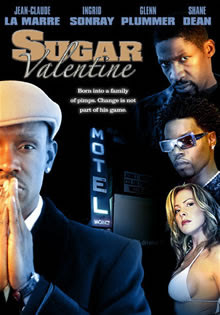 Sugar Valentine is a hidden gem. It is low-key and different. Jean-Claude La Marre plays the main character. Sugar wants to have a simple life. He takes care of his father in the hospital. To pay the bills he borrows money from some gangsters. He can't afford it because he's a pimp and business is slow. Then he meets Rachael (Ingrid Sonray) and it changes his life. He falls in love and starts to not care about his profession. This is a very good movie because it's low-key and well-directed. Clifton Powell and Jean-Claude La Marre put in decent performances. If you liked (or disliked) La Marre's Brothers In Arms (2005) give this a chance and you'll be surprised how good it is.